Spain: Day 35 of 985 of the Spanish Civil War. Spain: Day 400 of 985 of the Spanish Civil War. CBI - China: Day 45 of 2,987 of the 2nd Sino-Japanese War. Day 8 of 106 of the 2nd Battle of Shanghai. Spain: Day 765 of 985 of the Spanish Civil War. CBI - China: Day 410 of 2,987 of the 2nd Sino-Japanese War. Day 71 of 139 of the Battle of Wuhan. The Japanese launch an offensive in Jiangxi Province in an attempt to cut off Chinese troops in Nanxun and along the Wuning Railway. Chinese troops withdraw from Xinzi after sundown and fall back toward Yikou. CBI - China: Day 775 of 2,987 of the 2nd Sino-Japanese War. Day 68 of 68 of the Battle of Tianjin. With Beiping (now Beijing) and Tianjin secured, the Japanese are in position to take the North China Plain. CBI - Mongolia: Day 102 of 129 of the Battle of Khalkhin Gol. Soviet troops attack the Japanese at Nomanhan in the Mongolian People's Republic on the border with Manchukuo. UK: Winston Churchill gives a speech in the House of Commons, saying "Never in the field of human conflict was so much owed by so many to so few," referring to the ongoing efforts of the Royal Air Force pilots fighting the Battle of Britain. Churchill first used his famous words upon his exit from the Battle of Britain Bunker on August 16, 1940. The sentence would form the basis of his speech to the House of Commons on August 20. He had initially rehearsed to say, "Never in the history of mankind..." but when asked, "What about Jesus and his disciples?" he immediately reworded it to "Never in the field of human conflict..."
This speech was a great inspiration to the embattled United Kingdom during what was probably the most dangerous phase (for Britain) of the entire war. 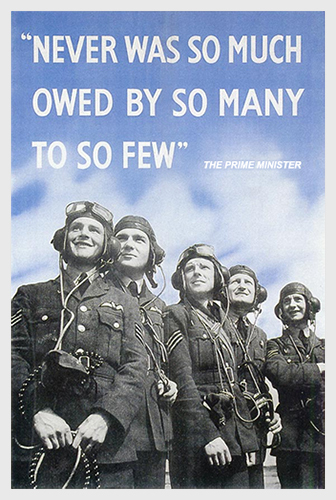 Note: The men in the poster photo are RAF Bomber Command pilots, not fighter pilots, as is generally assumed to be the "few." Mexico: Stalin's political enemy, Leon Trotsky, is attacked in his home in Mexico with an ice ax by undercover NKVD agent Ramón Mercader. Trotsky will die tomorrow. Atlantic: British sub HMS CACHALOT sinks the German submarine U-51 in the Bay of Biscay 100 miles west of St Nazaire, France. ETO - UK: Day 42 of 114 of the Battle of Britain. The Luftwaffe attempts to hit shipping in the Thames Estuary but fails to find any. Meanwhile, the RAF airfield in Manston is attacked. Thus far, the Germans have lost 20 percent of their Stuka force (JU-87s), so they decide to quit flying them over England. ETO - UK: Hermann Goering sends peace proposals to Britain via the Dutch and Turkish foreign ministries, but the proposals will be ignored by the British. East Africa: Day 72 of 537 of Italy's East African campaign in the lands south of Egypt. PTO: German armed merchant cruiser ORION sinks the British ship TURAKINA 350 miles east of New Plymouth, New Zealand. CBI - China: Day 1,141 of 2,987 of the 2nd Sino-Japanese War. Day 280 of 381 of the Battle of South Guangxi. Day 1 of 42 of the Hundred Regiments Offensive. The Chinese communists launch their Hundred Regiments Offensive against the Japanese in Hebei and Shanxi Provinces. ETO - France: After sundown, the Germans conduct another round-up of Jews in Paris. Their French passports are confiscated and they will eventually be deported to various concentration camps in Germany and Eastern Europe. Germany: Adolf Hitler authorizes the development of the A-4 missile, which will become the V-2 rocket that will terrorize London and Paris. Russian Front - Finland: Day 53 of 142 of Operation SILVER FOX, a joint German-Finnish campaign to capture the Russian port of Murmansk in the Arctic. Russian Front - Finland: Day 51 of 140 of Operation ARCTIC FOX, a joint German-Finnish campaign against Soviet Northern Front defenses at Salla, Finland. Russian Front - Finland: Day 60 of 164 of the Battle of Hanko. Russian Front: Day 60 of 167 of Germany's Operation BARBAROSSA, the invasion of the USSR. The Spanish Blue Division arrives in Poland to reinforce the Germans. Russian Front - North: Army Group North reaches the outskirts of Leningrad. Russian Front - Center: Day 4 of 23 of the Battle of Dukhovshina, Russia. Russian Front - Center: Day 28 of 38 of the Battle of Gomel, Belarus. Russian Front - South: Day 13 of 70 of the Siege of Odessa, Ukraine. Romanian warplanes destroy a Soviet train at Odessa. Russian Front - South: German Army Group South captures Kherson on the Black Sea and opens the gate to the Crimea. MTO - Libya: Day 133 of 256 of the Siege of Tobruk. East Africa: Day 437 of 537 of Italy's East African campaign in the lands south of Egypt. CBI - China: Day 1,506 of 2,987 of the 2nd Sino-Japanese War. ETO - France: US 8th Air Force B-17s bomb the marshalling yards at Amiens. Russian Front - North: Day 347 of 872 of the Siege of Leningrad. Russian Front - North: Day 108 of 658 of the Siege of the Kholm Pocket. Russian Front - Center: Day 22 of 64 of the 1st Battle of Rzhev-Sychevka, Russia. Russian Front - South: Day 54 of 150 of Germany's CASE BLUE. The Soviets counter-attack north of Stalingrad, but elsewhere German troops reach the Volga River. German Panzers attack northeast from Abganerovo, but cannot break the Soviet defenses in the hills of Tundutovo. East Africa: Day 108 of 186 of the Battle of Madagascar. CBI - China: Day 1,871 of 2,987 of the 2nd Sino-Japanese War. Day 98 of 124 of Japan's Zhejiang-Jiangxi Campaign, launched to punish anyone suspected of aiding the Doolittle raiders in China. Roughly 250,000 Chinese will be killed. PTO - Alaska: Day 75 of 435 of the Battle of Kiska, Aleutian Islands. PTO - Malaya: Day 183 of 357 of the Battle of Timor Island. PTO - New Guinea: Day 31 of 119 of the Battle of the Kokoda Track. US 5th and 13th Air Forces provide air support. PTO - Solomon Islands: Day 14 of 187 of the Battle of Guadalcanal. US 5th Army Air Force provides air support. More US Marine fighter planes, from the USS LONG ISLAND arrive at Henderson Field. Russian Front - North: Day 712 of 872 of the Siege of Leningrad. Russian Front - North: Day 473 of 658 of the Siege of the Kholm Pocket. Russian Front - Center: Day 47 of 50 of the Battle of Kursk, Russia. Russian Front - Center: Day 4 of 48 of the Battle of Bryansk, Russia. Russian Front - Center: Day 14 of 57 of the 2nd Battle of Smolensk, Russia. Russian Front - Center: Day 14 of 14 of the Battle of Spas-Demensk, Russia. The Soviets liberate Spas-Demensk (note: Spas-Demensk is a hyphenated name for just one town). Russian Front - South: Day 39 of 48 of the USSR's Lvov-Sandomierz Offensive. MTO - Italy: German SS Lieutenant Colonel Otto Skorzeny returns to mainland Italy after being shot down by British fighters two days ago. There he hears that the prisoner Mussolini might be on the island of Elba, Italy. MTO - Italy: The Allied Air Forces bomb targets at Capua, Aversa, and Benevento. CBI - China: Day 2,236 of 2,987 of the 2nd Sino-Japanese War. US 14th Air Force bombs the Tien Ho Airfield at Canton. PTO - Indonesia: The US submarine USS GAR sinks a Japanese ship in Makassar Strait. PTO - New Guinea: Day 121 of 148 of the 2nd Battle of Lae-Salamaua. US 5th and 13th Air Forces provide air support. The Japanese troops at Salamaua begin a last-ditch defensive effort. PTO - Solomon Islands: Day 62 of 67 of the Battle of New Georgia. US 5th and 13th Air Forces provide air support. US Army troops secure Baanga island, located just off western New Georgia. PTO - Solomon Islands: Day 6 of 56 of the Battle of Vella Lavella. US 5th and 13th Air Forces provide air support. ETO - UK: Day 69 of 86 of the V-1 "Buzz Bomb" offensive on Britain. ETO - France: Day 27 of 29 of the Breakout Battle of Normandy. Allied Air Forces provide air support. The Allies encircle the Germans in the Falaise Pocket and annihilate one division. However, 26 German divisions manage to break out along a single road and stream out of the pocket within six hours before the pocket is resealed. Meanwhile US troops reach the west bank of the Seine above Paris. ETO - France: At Falaise, Major David Currie becomes the only Canadian to win the Victoria Cross during the Normandy campaign. ETO - France: Day 20 of 284 of the Battle of Brittany. ETO - France: Day 6 of 32 of Operation DRAGOON, the Allied invasion of southern France. Allied troops continue racing up the Rhone Valley. French resistance fighters liberate Toulouse. Poland: Members of the Armia Krajowa attack the State Telephone Exchange high rise building in Warsaw, Poland. Russian Front - North: Day 11 of 28 of the Battle of Tartu in southeastern Estonia. Russian Front - Center: Day 24 of 32 of the Battle of Kaunas, Lithuania. Russian Front: Day 5 of 12 of the German Operation DOPPELKOPF in Lithuania. This was mounted to restore the connection between German Army Groups North and Centre. Russian Front - South: Day 1 of 10 of the Battle of Romania, 2nd Iaşi (Jassy) Offensive. With 900,000 men, the Soviets break through the Romanian 3rd Army defenses. MTO: US 15th Air Force bombs targets in Hungary, Czechoslovakia and Poland. CBI - Burma: Day 142 of 302 of the Chinese Salween Offensive. US 10th and 14th Air Forces provide air support. CBI - China: Day 2,602 of 2,987 of the 2nd Sino-Japanese War. Day 126 of 259 of Japan's Operation ICHI-GO. PTO - Caroline Islands: US planes hits targets on Yap and Pagan Islands and in the Truk Atoll. PTO - Dutch New Guinea: Day 50 of 61 of the Battle of Noemfoor. Although the island has been declared secured, bitter fighting from Japanese continues. PTO - Japan: US 20th Air Force B-29s bomb the Imperial Iron and Steel Works at Yawata during the day and again during the night. PTO - New Guinea: Day 250 of 597 of the Battle of New Britain. US 13th Air Force provides air support. PTO - New Guinea: Day 121 of 481 of the Battle of Western New Guinea. 5th Air Force provides air support. PTO - New Guinea: Day 68 of 80 of the Battle of Lone Tree Hill. PTO - New Guinea: Day 42 of 47 of the Battle of Driniumor River. PTO - Solomon Islands: Day 294 of 295 of the Battle of the Bougainville Islands. US 13th Air Force provides air support. Japan: Allied POWs held in brutal conditions at Tokyo Base Camp #1 are informed by the camp commander that "the war has come to a point of cessation" and are allowed to bathe in the river, where they are soon spotted by an American plane. The POWs are elated, including Olympic star Louis Zamperini and Gregory "Pappy" Boyington. CBI - China: Day 2,967 of 2,987 of the 2nd Sino-Japanese War. Day 12 of 25 of the Soviet Invasion of Manchuria. Soviet troops declare the cities of Mukden, Changchun and Qiqihar in northeastern China secure. Germany: The Doctors' Trial ends in Nuremberg, in which a US military court will find 16 of the 20 doctors and 3 Nazi officials guilty of human experimentation. 7 will be given death sentences and the other 9 will get prison sentences. Dozens of stories of the circumstances and odds facing Jews and those who would help them.